Woodend is a collection of self catering holiday homes sleeping up to six people, nestled in a remote location within a relatively quiet and unspoilt area of the Lake District National Park, just a short drive from Ulpha near Broughton-in-Furness. From the holiday cottages, guests can enjoy fantastic views towards Scafell Pike and we are conveniently located for those who want to explore the many walks in the surrounding area. These unique self contained holiday properties are full of character and charm and set within, though not part of, a working farm and are surrounded by various farm animals. We are pet friendly and all properties have multi fuel "log-burning” stoves, Wi-Fi and Sky TV. 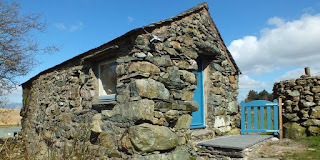 The Bothy is a self contained building standing on its own offering cosy and comfortable upside down accommodation for two people. It combines the old with the new and has a multi fuel log burning stove. Stone steps lead up to the front door where you enter into the combined lounge/dining/kitchen area with its wooden floor and views towards Scafell Pike. The Buttery is a cosy self contained annexe to the house offering character accommodation for two people. It combines the old with the new and has a multi fuel log burning stove in the living area. A step leads from the parking area to the front door where you enter into the combined lounge/dining/kitchen area with a slate floor and oak beams. A half flight of steps leads down to the oak floored bedroom and the en suite bathroom comprising of a traditional slipper bath on feet, hand basin and WC. Our holiday cottages are situated 3 miles from both the Eskdale Valley and the Duddon Valley and is conveniently located for Ulpha, Eskdale, Boot, Seathwaite and Broughton-in-Furness. It is also only a short drive from the more populated areas of Coniston, Windermere and Ambleside. Excellent Articel Thanks For Share Very valuble information.